Keith Tyssen is a Designer/Silversmith and with wider Metalsmithing interests. Productive since 1958 and today similarly engaged. He has three daughters: Katie, Sarah and Zoe, plus his son, Joe, and six grandchildren: Jemima, Joseph, Louie, Matilda, Samuel and Maximilian. Bishops’ Morse made during 2nd yr. studies at the RCA, together with the design for a Verger’s Wand (the Wand was made by Padgett & Braham Ltd., except the dove was of my making. Both items for Guildford Cathedral, commissioned given by The Goldsmiths’ Company. Two further views of the King and Queen Chess pieces made during 1st yr. at the Royal College of Art. Chocolate Pot designed during my 2nd yr. at the RCA and manufactured by the resident Master craftsman, Tom Boucher. A Mace commissioned by Sir Oliver Lebus for The Furniture Makers’ Guild and made primarily by Padgett & Baham Ltd. and T&A Wise Ltd. then in Broadwick Street, Soho, London. This was a memorable learning experience during my 2nd. yr. at the RCA. And the fantastic quality of craftsmanship adds greatly to the richly decorative effect so that the Mace is, for me, ‘a jewel’. I must mention the joy I felt on seeing the naturalistically worked silver leaves of British trees which Mr. A. Wise was carving and together with a spiralling ribbon of silver he was most skilfully, if magically it seemed to me, inlaying into the Yew-wood Shaft. Another view of the Mace commissioned by Sir Oliver Lebus for The Furniture Makers’ Guild. Third view, Mace for The Furniture Makers’ Guild. Cigarette Box for Stockport Grammar School, designed during my final year at the RCA, (silver, lined with Yew, the box was substantially made by the resident Master craftsman Tom Boucher, engraving by T & A Wise Ltd.). Badge of Office for the President of The Guild of Students, Birmingham College of Advanced Technology – now Aston University, (silver, enamelling & engr. by Phil Barnes, green Aventurine Quartz). Standing Pyx/Ciborium commissioned by The Greatham Hospital, Co. Durham. With cover removed, Standing Pyx/Ciborium for The Greatham Hospital, Co. Durham. A 4-light Candlestick with a low ‘scalloped’ base. (silver, with black acrylic inset foot). 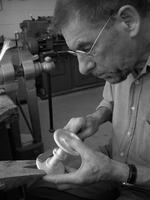 This is a trial fabrication prior to attempting the more difficult 6-light Centrepiece with independent Hors-d’oeuvre dishes, which was subsequently commissioned by The Goldsmiths’ Company. Purchased for The Pearson Silver Collection.